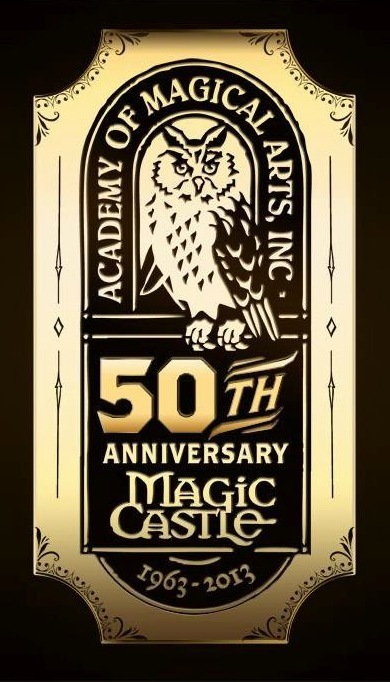 The Magic Castle in Hollywood celebrated its 50 Anniversary this week. 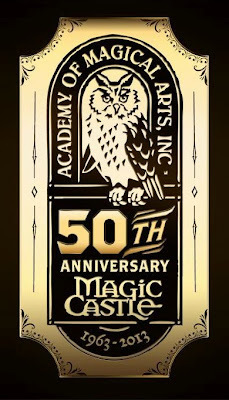 The official home of the Academy of Magical Arts opened on January 2, 1963. Of course, no visit to the Castle is complete without a peek inside their famous Houdini Seance Room. The Houdini Seance Room was originally one of four bedrooms inside the Lane Mansion. It was converted by John Shrum, Dr. Tom Heric and Milt Larsen on February 27, 1969 (so technically it's not yet 50, but I like my headline). The centerpiece of the room is a beautiful signed Lalique bronze chandelier which hangs over the large round seance table. The room was remodeled in 1997 and again in 2008. The room contains a wonderful collection of authentic Houdini artifacts, some of which were handed down from Bess and Edward Saint to the parents of Magic Castle co-founders Bill and Milt Larsen (Bess and Ed lived very near the Lane Mansion in their final years). There is a truly intense "Houdini vibe" in the room that I'm convinced emanates from these artifacts which, after all, are only a few hands away from Houdini himself. There's also a beautiful Houdini portrait painting by Craig Vilaube. Celebrities and dignitaries of all kinds have attended seances in the Houdini Room, including a famous 1991 visit by President Ronald Reagan. At one point the room had a full-size Houdini mannequin that would lower from a secret trap in the ceiling during the dark of a seance. According to long-time medium Leo Kostka, one night the mannequin's head fell off and landed in the lap of a Japanese woman, sending her entire tour party screaming from the Castle. The Houdini Seance Room has seen artifacts come and go over the years. 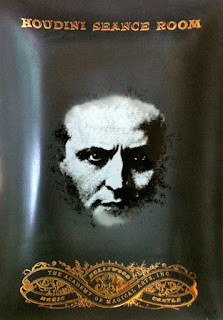 For several years Houdini's original Metamorphosis trunk (the one owned by Patrick Culliton) sat in a corner and actually played a role in the seance. Today a Milk Can sits inside the room. While it isn't an authentic Houdini Milk Can, it was the can used in a cut scene from the 1953 movie, Houdini (I'm not sure the Castle even knows this). Originally the room had three large display cases filled with Houdini artifacts. At some point one case was removed and replaced by a faux fireplace (you can see a photo of the now absent case in Gibson's The Original Houdini Scrapbook, page 219). The room also holds an official proclamation by Mayor Tom Bradly naming October 31, 1975 "Harry Houdini Day" in the City of Los Angeles. There's also a walnut magic wand touted to be "Harry Houdini's Personal Magic Wand". But my single favorite item in the Houdini Seance Room is a photo of an 8-year-old Milt Larsen showing a magic trick to an attentive Bess Houdini on the porch of the Larsen home in Pasadena. Priceless. 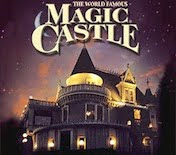 Happy 50th Anniversary to The Magic Castle! It would have been so worth it to be there when the head dropped. I'll bet they're still dining out on that one. Could you post the photo of young Milt Larsen and Bess Houdini? I'm afraid I don't have it. It's unique to the Seance Room. A family photo.